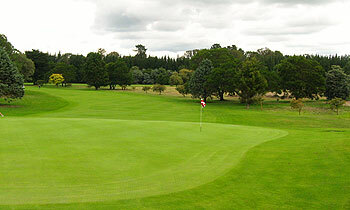 Members and guests of Hastings Golf Club – better known locally as Bridge Pâ – play their golf on a wonderful, free-draining, parkland course laid out within 210 acres on Heretaunga Plains (next to the aerodrome), just outside Hastings. The club – formed in 1898 – moved to their current site in 1912 where they gradually developed the course with assistance from Charles Redhead over the years. In 1970, a decision was taken to radically alter the course. In the words of the club, “to provide the two even nines which exist today” and the modern-day layout owes much to the vision of former President Roy Skittrup and his committee from more than 35 years ago. “Flaxmere” is the 5th hole at Hastings and it’s the hardest hole on the card. A 420-yard, par four, which doglegs slightly right (with out of bounds all the way down that side of the fairway) to a long, two-tiered green that rarely yields anything better than bogey scores. One of the best holes on the back nine is the 365-yard, par four, 15th (“Land’s End”) where the tee shot is played through a narrow chute of trees and the elevated, split-level green is protected by a large tree on the left and a bunker on the right. One of the most famous golfing sons associated with Hastings is Stuart Jones – seven times national amateur champion – who has been a fine ambassador for the club over many years both on and off the course. Rather poignantly, Hastings hosted the New Zealand Amateur Strokeplay Championship in 2012. I had arranged for a large group of us to play the course and ended up having one of the worst experiences and embarrassments possible. The course was in poor condition, our times weren't booked in though we had arranged months in advance. Playable to an extent, except for the fact that there were dead birds scattered around everywhere. Very strange environment, not enjoyable, and the staff were rude and abrupt. AVOID. I have elaborated my disappointment in the archetypal Kiwi tree-lined parkland course in other reviews (see The Grange, Napier, or Invercargill). However, there are a number of courses that, whilst you can see that they may have some elements of that dull penal format, they also clearly have plenty extra to offer. There might be some clear influence of the strategic school, meaning that the course might be played in different ways in different circumstances. There might be some intriguing putting surfaces, bunkers that do more than just penalise, or even some use of visual deception. There may even be something as radical as a semi-blind tee shot (they don’t often like that type of thing in this part of the world, I’m told). One way or another, there has been some consideration and imagination put into the designs that lifts it above the mediocrity commonly found in this country’s club courses. I think that this description could be applied to a number of our ranked courses, e.g. Kelvin Heights, Rotorua, Otago, St Clair and Wanaka. And I would add Hastings to that list. On the face of it, there’s the flat topography and generic lines of trees that threaten to disappoint, and to be honest, maybe seven or eight of the eighteen are from that mould. But there is plenty of interest elsewhere. There is a much greater sense of space, in contrast to the suffocating tree lines of its peers (has there been a tree culling programme at some point?). There’s a gentle ripple to the ground that always seems to add value. There are some appealing green sites with what looks like new and improved bunkering (according to Google Earth) on the 3rd and the 15th. And the shape of many of the holes (i.e. the positioning and angle of the dogleg) appears to have been planned so that ‘just hitting the fairway’ is not an option – more specific targets need to be hit, or the approach will need to be shaped with considerable skill (I’m talking 3, 11, 12, 14, 15). I also enjoyed the par-5 10th – so good to see a semi-blind tee-shot that visually unsettles without denying the golfer a sight of where he wants to play. And this is also the one hole where bunkers clearly elicit decisions, for both pros and club golfers. The course was in spanking nick on the day I played (a week after the NZ Amateur) – would be interesting to hear comment from any readers as to whether it is always this good – I suspect it might be. On the down side, I don’t think this is the type of course (i.e. fairly level, conventional parkland) that can get away with its fairly minimal hazards (there are 6 holes without sand), especially when many of the trap placements are unimaginative.